Website relaunches and migrations are complex and risky SEO operations. 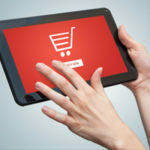 If not done correctly, companies can significantly impact their site’s performance and rankings. In extreme cases, it’s possible to take an entire site offline and forfeit all previous brand equity in the search results. For a good illustration of the peril, look no further than www.whitehouse.gov. 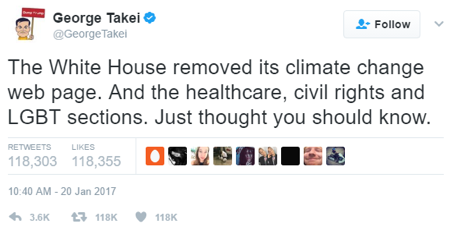 If the goal was making Whitehouse.gov great again, this post will examine how the Trump administration got it wrong. In conjunction with Donald J. Trump’s Jan. 20 inauguration, administration officials followed the typical practice of replacing the outgoing president’s proposed agenda with the incoming’s. Unfortunately, several oversights occurred during the process, resulting in marked site performance declines. Before the new site’s launch, SEO Visibility for the URL was 202,731, a proprietary metric created by Searchmetrics for measuring site performance. It’s based on the number of keywords for which a site ranks, their position in the search results and their search volumes. After the old site was archived under obamawhitehouse.archives.gov, visibility dropped 24% in the first week, to 153,872. After a month, it had fallen 31% to 139,779. Some of this SEO Visibility did shift to the archived site, but we can only attribute less than 2% of the decline to that. The most critical part of any migration is conducting an inventory of all pages on the existing site and mapping them a corresponding landing page on the new site. This ensures that users who access legacy pages are redirected to relevant pages and search authority from the previous pages is passed through to the new landing pages. After the migration, only 51% of the original pages properly rendered or were redirected to relevant landing pages. A majority of these pages were from the “Briefing Room” (blog) of the old site. 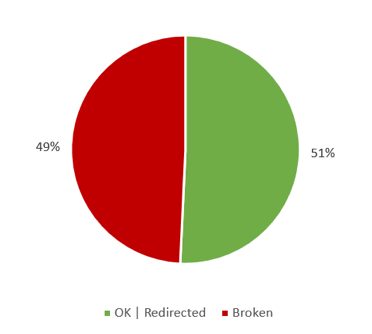 The remaining 49% are no longer valid and were not redirected. This is a HUGE NO-GO! 100% of pages from the previous site should be valid or redirect to another, valid page on the new site. 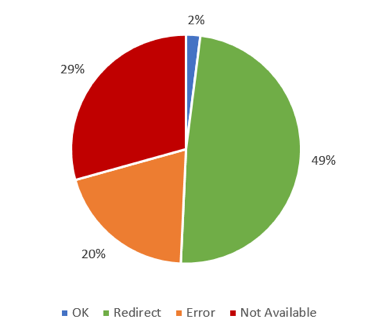 Looking more closely at the issue, we see that 2% of the pages IDs were not changed and 49% were redirected to new landing pages. 20% were not redirected and return “page not found” errors. 29% were completely removed and don’t even return a “page not found” error. Prior to the migration, WhiteHouse.gov ranked well for several, high-volume keywords. Here are some high-volume terms that ranked at the top of page one in the search results and lost all rankings after the relaunch. Some terms, like the president names, did eventually recover. However, terms like “sequester” and “net neutrality” never recovered, while terms like “budget” made a partial recovery. The site was ranking in position three for “budget” and now ranks in position 30 because that page no longer exists; a less-relevant page is now ranking lower for the term. In addition to lost rankings, these technical errors caused some major PR issues. Several pages about some of Obama’s key issues were not incorporated into the migration process. Instead of returning valid pages, they return “not found” errors. Here are a few examples of the backlash from social media and traditional media outlets. Looking closely at what went wrong, it seems the Trump administration’s webmasters ignored some of the basics of SEO. The three issues that contributed most to the decline in SEO visibility were subdomain management, a change in site structure and poor redirect strategies. 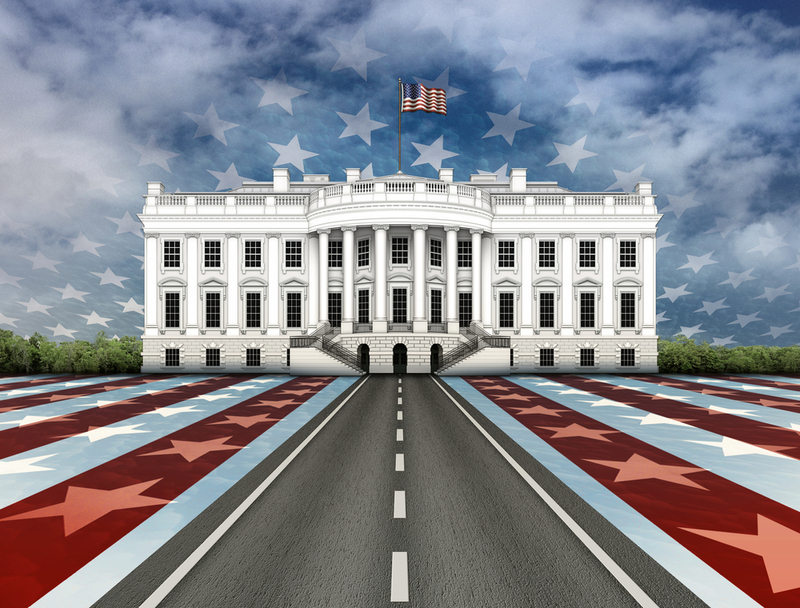 While the Petitions subdomain represents less than 1% of WhiteHouse.gov site traffic, it still has value because it’s constantly updated with fresh content – a key trend for search engine rankings. 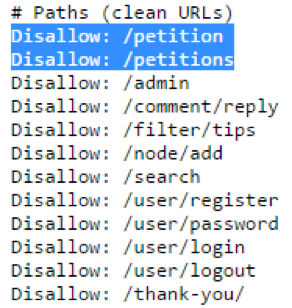 Unfortunately, only the basic navigation pages of the subdomain are accessible to the search engines because the individual petition landing pages are blocked in the robots.txt file. Since these pages are being blocked from crawlers, they will not appear in the search results and cannot be found by users in search. The new site has a different internal linking structure, which changes how the content is available to both users and search engines and how link juice flows through the site. Instead of going to “The Administration” page from that link in the header nav, the link leads directly to President Donald Trump’s page. Additional members of the Administration are accessible through the sidebar navigation. All of the authority these top-level category pages had accumulated is now gone. Also, since the category pages are gone, these new, default pages will receive much more authority than the subsequent pages in the category. It’s also worth noting that several of the submenu links in the header navigation have been removed. For example, the “Administration” menu of Trump’s White House site only includes links to Donald Trump and Mike Pence, their wives, the Cabinet and the Presidential Inauguration. In addition to these pages, Obama’s White House site included additional members of leadership, Executive Offices, Initiatives and additional Special Events. The new site does have pages for the Executive Offices, but they have no content. Other general content, such as “Inside the White House” tour information and the Photo Gallery were removed as well. Moving content from subdomains and implementing a new site structure aren’t inherently bad things. However, they need to be accompanied by a robust redirect strategy. Lack of execution in this area is what really impacted the site’s performance. Every page from the legacy site should’ve been identified and mapped to a landing page on the new site, or the archive site, to preserve link value and rankings for respective terms. By not following through in this area, WhiteHouse.gov lost a significant amount of authority, which shows in their drop in overall SEO Visibility. Despite having executed a poor migration and relaunch, the White House may be able to reclaim some of the lost authority by implementing these standard processes. First, the White House team should run a complete crawl of both the current and the archived White House sites. This will help identify all the pages on both sites. Ideally, they should’ve also collected baseline performance data, including traffic and ranking data for specific keywords and pages. Depending on which SEO tools they’re using, they may still be able to recover this data as well. This baseline performance data is useful for comparing how the site performed prior to the migration and how it is currently performing. 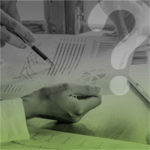 Then, any performance issues can be identified and addressed. The next step is identifying content gaps. Both sets of crawled URLs and ranking data should be further analyzed to reveal any high-performing pages on the old site that do not have corresponding pages on the new site. If pages from the old site do not have corresponding pages on the new site, the team should consider whether to build a page on the new site that covers this topic, or redirect the page somewhere else into the new site. They should seriously consider building pages that reflect Trump’s stance on some of Obama’s issues, rather than just take these pages offline. Even if these aren’t Trump’s primary issues, there are obviously people who are still passionate about these issues and would like to know his perspective on issues like LGBT rights and the environment. Plus, from a technical SEO perspective, these pages had accumulated authority that can be recovered and contribute to the site’s performance overall. They also need to identify and resolve any issues with content, such as the blank Executive Office templates and missing Photo Gallery. The final step is creating an extensive URL map. This map should include every page from the previous site and its corresponding page on the new site. Redirects need to be implemented for any URLs that are not exact matches on the new site. The Let’s Move subdomain should be reactivated to facilitate the redirects. No content needs to be put back on the subdomain – only a simple script in the root folder that manages the redirects. Content about issues, events and other content that is very specific to the Obama campaign should be redirected to the archived site. All other content should be redirected to the new site, if possible. Website relaunches and migrations require a significant amount of planning and can make a major impact to website performance. It’s important to accurately inventory all your content and have a detailed plan for moving it. 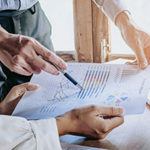 It’s also important to measure your past and future performance to identify and resolve any performance issues that arise. Kirby is a Professional Services Manager at Searchmetrics. He works with our enterprise-level clients, specializing in technical optimization. He supports large-scale initiatives, such as website migrations and international site optimization.